I guess it’s not really uncommon to expect that you might encounter a lot of bears while you’re on vacation at Disney World. You’ve got Fozzie Bear, everybody’s favorite comedian from The Muppets. You’ve got Winnie the Pooh, that chubby little cubby all stuffed with fluff. You’ve got all of those singing and dancing bears from The Country Bear Jamboree, which frankly I’m not really much of a fan of, but still … definitely bears! 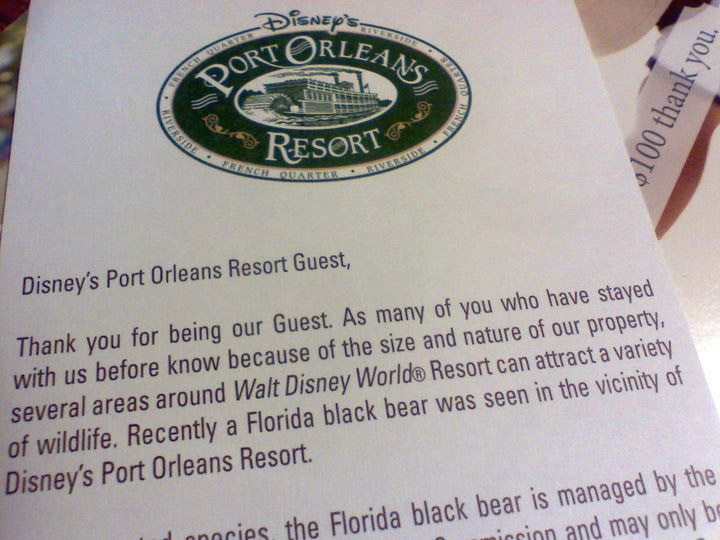 Oh yeah, and did I also mention the ACTUAL black bear that was apparently wandering around Port Orleans Riverside during one of my visits a while back?!?!?! I can just see it now – maybe I’m lounging in the hot tub, just minding my own business and not really paying attention to my surroundings, when along comes a black bear and wham! Black bear gnaws off my face. Or maybe I’m walking back from the Riverside Mill with a fresh pepperoni pizza for dinner … black bear steals my pizza and leaves me with no other options but a $4 Snickers bar from the vending machine for my late night snack. Or even worse of all, maybe I’m walking through the parking lot and stop to chuckle at one of those Stork Parking signs – which I’m wont to do because I find them amusing – and suddenly a black bear comes along and isn’t amused in the slightest, and consequently ends up suing me for sexual harassment. I’m telling you – there’s really no good way that an encounter with a black bear can go down, and it’s probably only a teensy bit melodramatic to say that I was completely mortified by the prospect of running into one of these 300 pound killing machines during the course of our stay. Sure, they say that you can’t live your life in fear, however in this case I think I would have to counter, you also can’t live your life inside of a black bear’s stomach, either!